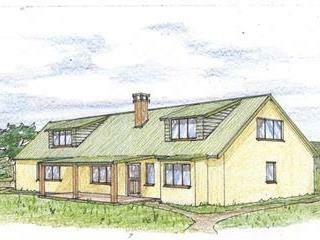 I received two requests from callers planning to build lettable units on their farms. This requires changing from agricultural to commercial zoning, a long and tedious process. But it may well be worth it, due to the growing number of requests for accommodation units to rent, as home loans are increasingly difficult to obtain. The surest way to construct lettable units is to start off small, and as cash and tenants become available, expand accordingly. 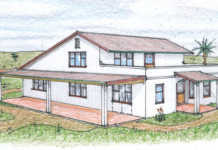 The sketch alongside shows a phase-built home. Phase 1 is the core of the home. 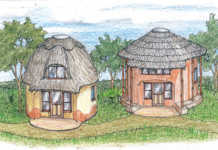 Depicted is a high-pitched roof over the units, with extra roof space that can be converted into usable attic rooms. The high-pitched roof is not costly; the additional pitch, from the usual, say, 30° to 45°, will add only 3,5% to the overall cost of the building. This is a typical feature of buildings in many northern hemisphere countries. Phases 2 and 3 can be added and adapted as time goes on. Many variations are possible. While the room sizes are rather cramped, they can be proportionately enlarged as desired. The garage can be converted into a main bedroom, an additional lounge, or extra kitchen area. If the attic bedroom 4 is added, the garage can be converted into a self-contained flatlet. 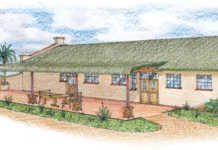 Also illustrated is a cottage of simple construction and materials. Aesthetic features can be added at minimal cost. Phased development has two major advantages. Firstly, any money spent, from your pocket or a loan, can be recouped as soon as possible.